This is a fantastic question. (My readers are just the best.) It is also a very necessary one. Because the answer to the question confers something desperately needed by about half of the image-bearers of God. Many women grow up with a sneaking suspicion at the back of their minds that they aren’t really made in God’s image. God is always presented to them as masculine, so….maybe they are really just God’s image-lite or something. Catch that last sentence? These things are, literally in the Greek, “out of God.” Man and woman, the masculine and the feminine, come out of God. In other words, God is both masculine and feminine. Pretty clear I think. Women need to know this—that they come out of God as much as men do. Incidentally men need to be regularly taught this too to prevent abuse. We all need to know it to truly celebrate womanhood. That is why, as feminist theologians are always quick to point out, God is at times represented in the Bible with the feminine. I can count about five or six times where this happens: God as mother (Isaiah 66:13; possibly Psalm 131:2–3); God “giving birth to” the mountains and the world (Psalm 90:2), and to Israel (Deuteronomy 32:18); God represented as a woman in a parable (Luke 15:8–10); and, if God the Second Member is to be identified with the feminine character of Proverbs, Lady Wisdom (Proverbs 1:20–33; Proverbs 8–9). So yes, God must be feminine as well as masculine. 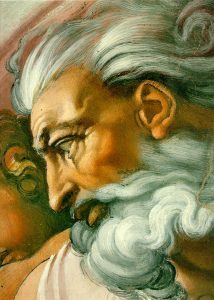 But, as my thoughtful reader pointed out, the overwhelming majority of biblical references to God use masculine imagery. Why? Why not have about an equal number of feminine descriptions as masculine descriptions of God? Wouldn’t that be fairer? Again—it’s all right, I don’t mind saying this over and over again, so long as it keeps needing to be said—GENDER IS ABOUT RELATIONSHIP. In this case of our referring to God, it is about our relationship with God. God teaches us to address Him as masculine because of the asymmetry of order. We are made to promote Him, to put Him forward to His rightful place of authority over us. I believe it was C.S. Lewis who said, “In relation to God, we are all feminine.” Yes, in the sense that we are called to make the earth His footstool, a place to rest His feet, to enable His mission in the world as defined in His covenants, and to submit to Him. So all followers of Jesus are envisioned as the Bride of Christ (Joh 3, Eph 5, Rev 19-21, etc.). He is Husband, Lord, and of course, Father, to us all.